Nostalgia for the new millennium. It’s summer in the northern hemisphere, the season when the attentions of those who follow fashion shift to achieving that suitable all-over skin blistering we commonly refer to as a “suntan.” I always marvel at how the desire for a deep brown “glow” exists in the same societies in which racism against all those not of European origin still flourishes. I also wonder at how these bronze aspirations exist so strongly in the western world, when pale skin is still the preferred look in much of India, the Far East, and Africa. Less than a century ago a tan, anywhere in the world, was seen as the unquestionable mark of someone who laboured outside in the sun because he could not afford to pay someone else to do it for him. The sun makes the skin tough and leathery, the opposite effect of what Victorian ladies desired. For centuries, women used everything from arsenic powder to drawn-on blue veins to highlight the soft, pale, translucent nature of their skin. The look was a very European courtly one, where the majority of social gatherings occurred indoors away from the prying eyes of the lower classes. And the ideal spread with European imperialism, condemning those races with naturally darker skin tones to perpetual inferiority. 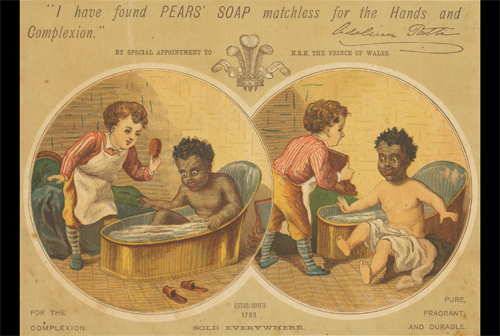 In the famous ad below, for Pears soap, a white boy uses Pears as part of a cleansing ritual with a black boy, the end result being lighter, more desirable, skin. Pears Soap ad, circa 1900. Isn't it amazing what a little soap can do? Clearly this imperial vision took root, as now the obsession with skin tone in places such as India outranks every other consideration when choosing a partner. Multinational cosmetics companies such as Vaseline seek to tap into the market of both men and women who want to lighten their skin with various products, and have even recently launched controversial facebook applications that allow users to digitally whiten their complexions. (Call this ad campaign Pears 2.0. )Again, the appeal is largely class (caste)-based, with the lighter skin of the Brahmin class marking the desired state. But in North America and Europe, the ideal today is very different. What changed, and why? In the early part of the twentieth century, the media began to report the health benefits of vitamin D (acquired through exposure to sun) for curing various ailments such as rickets, but, as with most trends, tanning never really took off until there was a cultural icon to represent it. I always assumed the shift to wanting bronzed bodies was due to the ascent of California as the glamour capital of the world with the rise of Hollywood in the first part of the twentieth century. Imagine my surprise when I discovered that it originated in that magical place that predates even Hollywood for glamour: France. Most histories of tanning place the turning point in the 1920s, when Coco Chanel got an accidental sunburn while vacationing on a yacht. Others who envied her lifestyle sought at least to emulate her look, and by the 1950s baby oil, bikinis and reflective glass were essential accompaniments for a day trip outdoors to maximize one’s sun exposure. Today it seems that dark skin has won the day (popular Victorian types like Nicole Kidman, Mr. Darcy, and anyone in Twilight notwithstanding), and tanning is close to a $5bn industry. Why? In part, it is due to the idea (which, ironically, originated in the Victorian era) that work is good in itself, and can co-exist alongside leisure. There is less of a classist stigma associated with hard work, particularly if one benefits from the fruits of it, in a truly meritocratic society such as the United States aspires to be. But it is also the triumph of what I consider the “Californian Aesthetic,” despite its Gallic origins. The Victorian emphasis on indoor, largely sedentary, activities has been replaced with an ideal of outdoor fun in the form of surfing, jogging and convertibles. Tanned skin is seen as essential to a healthy appearance, less because of the purported health benefits of vitamin D than its association with strength and physical fitness. Caroline Bingley and her turns about the room have been replaced by Arnold Schwarzenegger‘s Pumping Iron. The shift also marks a different view of leisure. Where a life of leisure used to be made visible through soft, pale skin, it is now conspicuous through a tan to signify one’s ability to vacation in sunny climes, à la Coco Chanel. It is experiential more than stationary. And it is undoubtedly American more than English, as stereotypes can attest. The pale, spotty Englishman is often compared with the smiling, healthy American with good teeth and a healthy glow from the sun. And I can’t write about this, of course, without mentioning that these images have been in play, in various forms, since propaganda advocating immigration to the US and settlement colonies began. (I’ve already touched on this in my various posts about Canadian nationalism, masculinity, and imperialism.) With the rise of tanning, the American takeover of British imperial ideals is nearing its completion. Is it likely that the aesthetic will shift again, and pale English roses like me will stand a chance of being fashionable? Despite all the recent initiatives to raise public awareness about the dangers of tanning (such as a 10% excise tax on tanning salons in the US), I doubt it. The rugged American outdoors (or the French Riviera – hey, I’m not picky) is still the place to be for all mainstream fashionistas. For everyone else: there’s always Pride and Prejudice and Zombies. However little Mr Darcy might have liked such an address, he contented himself with coolly replying that he perceived no other alteration than her being rather tanned — no miraculous consequence of traveling in the summer. Oh, snap. Take THAT, Miss Bingley. This entry was posted on Wednesday, July 28th, 2010 at 9:05 am and is filed under Uncategorized. You can follow any responses to this entry through the RSS 2.0 feed. You can leave a response, or trackback from your own site. I remember reading in an historical fiction novel  about the same transition (from pale to tanned) in ancient Rome; tanning came into fashion because two women from the nobility returned from exile with tans. There, it was nothing more than celebrity-mimicking, though. Not sure whether it was I, Claudius or Claudius the God by Robert Graves.